Premier League sides Tottenham Hotspurs and Newcastle will go head to head in the quarter final round of Capital One Cup tonight. Home side manager Mauricio Pochettino will once again start with Roberto Soldado as Emmanuel Adebayor is not fit for the game. The former Arsenal star was on a leave for personal reasons in his homeland. He has returned but is not fit for this game. Full-back Kyle Walker is likely to be rested as he has played twice last week. Eric Dier is the only player who could miss with an injury. Meanwhile, away side have lot of injury worries Davide Santon, Rolando Aarons, Siem de Jong, Tim Krul, Gabriel Obertan, Robert Elliot, Mehdi Abeid and Ryan Taylor are all out with respective injuries while Daryl Janmaat is suspended for this game. Good news is that Steven Taylor and Moussa Sissoko both have completed their suspension and are no available to play. Tottenham Hotspurs have scored in each game at White Hart Lane in the League Cup. Newcastle have qualified for the quarter finals for the first time since 2006-2007 season. The Magpies have won the last two games at White Hart Lane. 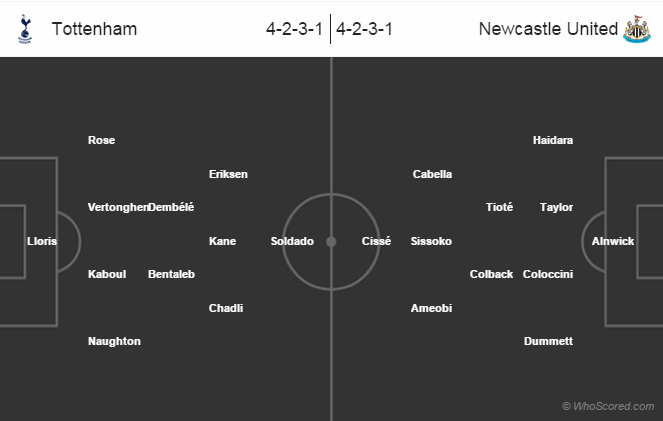 Tottenham Hotspurs 2 – 1 Newcastle United.